Larry Husby grew up on the family farm and was the oldest of three brothers and three sisters. He joined the Army National Guard at the age of 14 and had two years in by the time he graduated from high school at the age of 16. Shortly thereafter, Larry attended telegraph school and landed a job with the Soo Line Railroad as a telegraph operator. In 1961, his National Guard unit was called to active duty and he shipped off to Germany, where Larry became an officer and learned to fly. He graduated first in his class at helicopter school. After his unit returned to the U.S., Larry was hired as an airline pilot by North Central Airlines, which, through a series of mergers, became Northwest Airlines. It was not until after he retired from Northwest in 1999 on the 747 that Larry was able to devote most of his time to Heartland Aviation. 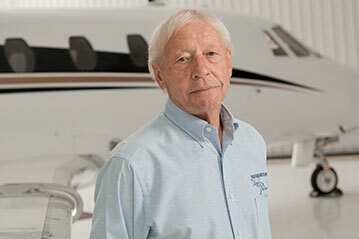 He now flies the Citation III / VII on occasion and is the Director of Operations. When not flying for Heartland he can be found waxing something or flying around in his Waco bi-plane or Hiller helicopter.